A fantastic 6-shot value! 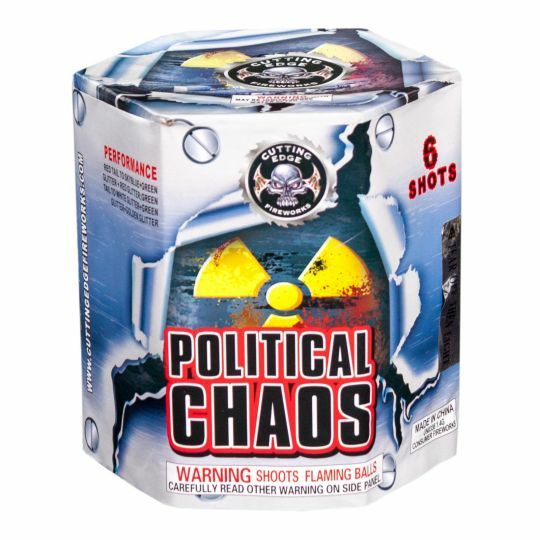 Political Chaos features two alternating effects with vibrant comet tails and glitter. Special fires alternating shots of brocades with green, white, and blue glitter. No Signs of Life fires 10 shots of flashing stars into the sky, that break into massive blue bursts! The first 10 shots are green tails to silver brocades with red and green tips; followed by a 2-shot finale of delayed-crackling bursts.